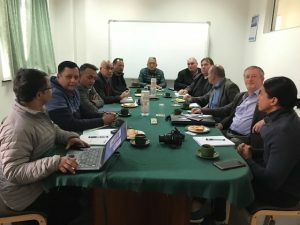 The UKNFS as part of a broader UK business consortia team — GnERGY Alliance — with our UKNFS friends at GnERGY, Cydweithio Ltd and Things To Do In [TTDI] online directory and, has just recently concluded a full programme of key meetings in Kathmandu. These included, in particular through GnERGY’s CEO, Major Tikendra Dal Dewan JP, who led through careful preparation from the October 2018 period, the necessary key meetings. 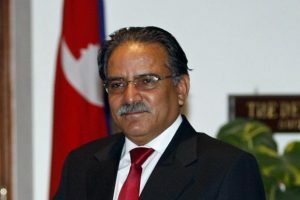 The latter on participation in 2GW of Nepal hydro projects and related power grid meetings with both government and private business including senior Nepal banking executives, national agency leads, ministers, and personal audience at his home with former prime Minister and Prime Minister Designate the Rt Hon Pushpa Kamal Dahal ‘Prachanda’ Jiu. Meetings with NTNC (see below)and Kathmandu Central Zoo leads, were also made possible by the GnERGY CEO, with the latter/Central Zoo formal visit having a January 2018 context when in a personal capacity, and as an expert in this field, as a former zoo owner in the UK, TTDI’s Managing Director Paul Nash following through the preceding UKNFS delegation visit of the preceding year, which was Paul’s first visit to Nepal saw him visit the Central Zoo in a private capacity. Other key meetings during this historically important January 2019 GnERGY Alliance delegation visit, included figures in the agriculture (enabled by Major Tikendra) and other, community (coordinated by UKNFS CEO Alan Mercel-Sanca), sectors. Of course, for obvious considerations it is not possible to disclose specifics of the significant trade and business achieved we can indicate these met and surpassed for both sides the original expectations set out to achieve in this second UKNFS Delegation visit, and are now leading to concrete action in follow ups in both our countries. Nevertheless, we are delighted to share some exciting particulars, and themes to have emerged: these will hearten all who hold UK – Nepal friendship at a deep meaningful level. The delegation visit indicated, to the great contentment of all who met with us, the realisation that the UK Nepali community and UK private sector partnership signified a new dynamism from Britain exactly in line with the values and ambitious strategic goals of Nepal, that seeks developed nation status by 2032 as a political priority. The dynamism and progress with ‘can do, will do’ spirit of Nepal that we encountered throughout all meetings and engagements was striking and inspiring, and matched the Britain is Back attitude of the UKNFS delegation. The Can Do & Open for Business with the world approach, and the phenomenal civic spirit of community interest being all pervasive, matches the trade passions of both our Nations at a critical pivotal point for both. The next 200 years of friendship will be a trading and community partnership. The National Trust for Nature Conservation (NTNC), and with it, Kathmandu Zoo, formed a particularly clear example of this. NTNC is leading the way in not only nature conservation and preservation across Nepal, including remote areas that are often overlooked by the more traditional Western approaches on ‘Aid,’ in terms of local-led, community involved, socio-economic community empowerment development models, These latter accord exactly with those of the UKNFS, the GnERGY Alliance and the UK business consortia, and the vision and strategic direction of the Government of Nepal, as was made particularly clear through the substantial engagement meetings of the consortia with NTNC (both initial and follow up). Biodiversity conservation, zoo management and [national and international] tourism development were particularly discussed as areas for partnership activities. This opportunity involves expertise investment and link to the UK providing flagship support through such involvement to the Visit Nepal 2020 campaign. Mr Paul Nash (Things To Do In founder and Managing Director) who was a zoo owner with a great passion for animal welfare, played a core role in these developments and opportunities to demonstrate new dynamics of new Nepal – UK friendship. In the initial delegation visit of January 2018, Paul visited Kathmandu Central Zoo. On that visit Paul noted and referred on to the zoo management, a number of not good animal welfare issues (as regards UK/Western standards of animal welfare). On the return visit which commenced with a detailed presentation and Q&A session for our delegation led by Paul, with the director and senior staff of the zoo, on being given a guided tour, it was found all the issues had been addressed, and excellent innovations on information in English for each of the zoo compounds and sections, provided. We could see the seriousness with which Kathmandu Central Zoo listened, took action, and is bringing its facilities to Western standards, with Paul’s guidance a key catalyst. On the guided tour it was also noted that one section of the zoo was opened by HM Queen Elizabeth II, some 50 years ago in the early years of her reign – demonstrating the special Nepal – UK links at such a prestigious level between the two countries, at the zoo in earlier times. On asking we learned that had not been any significant (and certainly no formal) links with the zoo from the UK side; this until the UKNFS delegation visit. 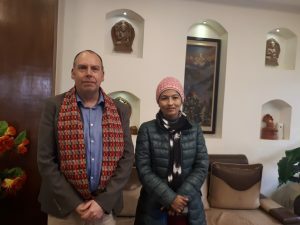 This has led the UK consortia delegation to, through the leadership of Mr Paul Nash, to lead on commencing a meaningful new UK relations chapter, particularly in regard the zoo development plans and the related much larger zoo that is planned for near Bhaktapur. A follow up meeting the same day with the Minister for Forests & the Environment, with the delegation and the head of the Central Zoo and Executive Director of the Nepal National Trust for Nature Conservation (NTNC) in which the initiatives were discussed during the formal visit of the delegation to the zoo, where praised and given ministerial support. Mr Lama has been the Member of Parliament since 1991 for the remote, beautiful Humla area of North-West Nepal. In the preceding UKNFS delegation visit in January 2018, UKNFS in Nepal Coordinator, Ganesh Panday ji (now a junior member of the government) introduced Mr Lama, with a view to seeking our/UK support on aspects of economic development for the benefit of his remote district and its people. Returning, a year later the necessary conversations were carried out, between Mr Lama, and in particular the software/electronics including related agricultural technology lead of the delegation, Mr Wynne Crompton (Cydweithio Ltd), enabling the commencement of a particular Humla area agriculture project targeted at boosting Himalayan Honey yields and production. Wynne being a highly experienced commercial beekeeper of 40 years on his farm in Wales will consequently import to the UK excess honey production resulting from the pilot project in Humla. 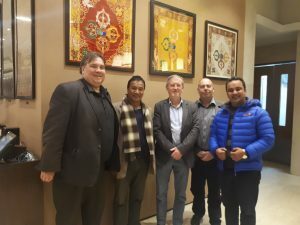 In addition, the topic of outreach to quality (increased spend) tourist audiences, particularly on spiritual and related health & wellbeing themes, was discussed by UKNFS CEO Alan Mercel-Sanca, with Mr Lama, who is an internationally renowned anthropologist (https://www.recordnepal.com/perspective/its-difficult-to-govern-a-place-if-you-dont-understand-its-ecology/). On this, the topic (raised and discussed in a number of other key meetings, particularly the NTNC and Central Zoo ones, but others too) of opening a new and important phase in the history of Nepal tourism promotion to UK and Western/International new audiences, particularly on spiritual, health & wellbeing (and medical), cultural & arts tourism, was discussed in conjunction with the Nepal Tourism Board (NTB) and Ministry of Tourism, Visit Nepal 2020 campaign. The UKNFS has long advised the importance of promoting Spiritual and related Health & Wellbeing tourism in the West. Mr Lama’s international stature in the field of anthropology and the related Higher Himalaya spiritual cultures was particularly seen as being able to contribute significantly to a new UKNFS spiritual tourism promotion initiative with Mr Lama’s valuable inclusion. This also being paralleled with work with the NTNC that has particular strong relevance on its great work on the natural environment dimension; this being also developed with the UKNFS in the coming months ahead of the NTB 2020 campaign. Back in the UK the UKNFS in partnership with the full spectrum of UK Nepali community organisations, is leading a national project to record aspects of Nepali cultural heritage. This too will be deployed through online, particularly by TTDI UK and TTDI Nepal to give substantial profiling of the spiritual culture, arts, and wellbeing tourism to the international community. Please watch this space for more news in the weeks and months ahead on UKNFS’s support of the Visit Nepal 2020 Campaign!! In addition, on minorities inclusion and gender equality, further meetings were held. In particular one with Sabita Upreti ji on autism: this legendary lady, has been for many years leading on the initiative to support those with autism, educating their family members, and also an ongoing initiative to have autism recognised as a distinct health condition by the Government of Nepal and its relevant ministries and national as well as local agencies. The UKNFS is very pleased to support this initiative and will be working with Sabita in a number of ways and areas that were discussed, including sharing UK work and support information on autism, and in return sharing back into the UK and broader West, the exceptional work Sabita’s Special School and Research Centre (SSDRC) has been carrying out with great success in utilising arts and other related means to provide tangible major therapeutic benefits to those with autism and those caring for them. This again an area where the spiritual dimension is very active in Nepal in ways considerably in advance of the West (which we know is increasingly seeing the wisdom and practices of South Asia as guide and inspiration). The audience with Prachanda Jiu, enabled and led by Major Tikendra, was highly appreciated by all the UKNFS delegation and UK Business consortia. Receiving the blessing of the two-times former and current Prime Minister Designate for the specific areas of work and initiative – energy/hydro, agriculture and related, healthcare & related, tourism, and aspects of British expertise across a range of subjects [relevant to realisation of the by 2032 Economic Developed Nation Status] — the UK consortia are bringing to Nepal, which were noted with great happiness by Prachanda Jiu, who kindly after dialogue with each of the consortium members signalled his support and direction of same to colleagues in the Nepal government. The matching of Government of Nepal perspectives on economic growth linked to community / total society (geographical and specific population groups) substantial and meaningful outreach and benefit with the ethos and approach of all in the UK consortia, was very strong. 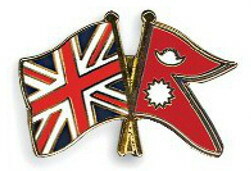 So too was the perception that such models of equal, respectful, mutually listening approaches as the UK consortia begins work within Nepal, also signalled the model of new phase of relations and friendship between the two nations and peoples, that for some time, the government of Nepal, and large sections of business and community had been awaiting from their oldest friend, the British, in the West. Britain is Back! Jai Nepal – British Friendship!